This page has moved. You will be automatically redirected. Click here if you do not want to wait. 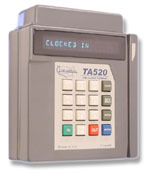 TA50XL is an easy to use, yet powerful time and attendance solution that allows you to automate your company's timekeeping and attendance tracking. With built-in setup wizards and simplified daily operations. 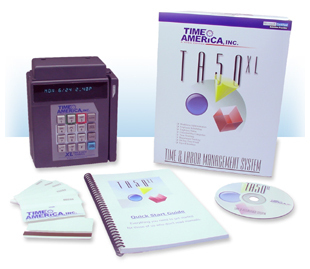 TA50XL completely eliminates paper timesheets. Employees clock in and out at a data terminal using the badges that are included with the system. The data terminal immediately transmits employee puches to the TA50XL software which automatically applies your pay rules automatically, consistently and impartially. TA50XL's mag-stripe data collection terminal comes with cabling for a direct, serial connection. Since the terminal is always on-line, supervisors can immediately see who's absent without taking extra steps to poll the data collection terminal. And More Than 40 More Reports! Copyright © 1997 - 2003 A.T.R. Systems, Inc. All Rights Reserved.